Bennett led Golds to the County League title in 2015 and is now back, initially for a ten-game spell in his second stint. The club parted company with former boss Nigel Geary on Monday evening then after a brief chat with chairman Rob McAlees, Bennett’s return to Golds was confirmed. Bennett is quick to emphasis current work commitments means it is not possible to look any further ahead than the initial ten matches he is set to oversee. Interim manager from last season and currently part of the squad, Mitchell Hand, and James Askew will make up Bennett’s backroom team. 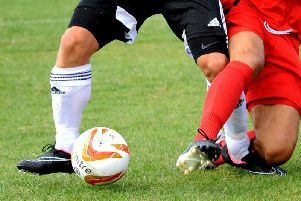 Geary’s final game in charge was the 4-2 SCFL Premier Division defeat at Billingshurst on Saturday as they dropped down to tenth in the table. Bennett, who won the County League as a player with Golds in 1991 before achieving the same feat as manager 24 years later, has not enjoyed seeing the club drop down a division. He now wants to play his part in getting Golds back on track and said: “I’m incredibly busy with work at this moment and I want to stress that this is only for ten games. “After a chat with the chairman Rob, I decided to come back to the club and try to bring the feelgood factor back. Bennett’s first concern is to get a team out for Saturday's home league game with Mile Oak. A squad shake-up over the summer saw Geary bring in virtually a whole new team but Bennett is expected to take training this evening. He said: “Mile Oak are always a tough team to play, we’ll just look to get a team out and see what we can do against them. Geary was named manager in the summer but lasted less than two months in the position. The departing boss felt he could not have given anymore. He said: “I walk away with my head held high, knowing I could not have given anything more than what I did. "I’d say this job is one of the toughest in County League football at this moment. “I felt I was starting to assemble a squad that could mount a challenge as the season went on. You never know what can happen in football so it’s difficult to put an exact time on how long I’ll be out the game.